You are here: Home / online shopping / The Children’s Place FREE SHIPPING plus 20% off! It’s BACK! Today at The Children’s Place, you can score FREE SHIPPING plus get 20% off your total purchase price! Right now, they have Basic Denim for boys and girls on sale for $10, which means you can score jeans for just $8 shipped! They also have graphic tees for $4! This is a great time to STOCK UP and do some back to school shopping! The Children’s Place: 20% off PLUS free shipping! The Children’s Place Monster Sale plus FREE shipping and 20% off! The Children’s Place 25% off plus FREE SHIPPING! 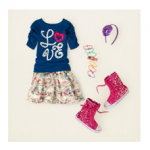 The Children’s Place: 25% off PLUS free shipping!